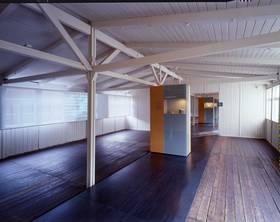 Barrack 39 was reconstructed in 1961 out of original parts, and then restored in 2001 by the architecture firm Braun, Voigt & Partner. Historically, it was a part of the so-called “small camp” which was built in 1938. Between 1938 and 1942, mainly Jewish prisoners were penned up in there together. The exhibition “The ‘daily life’ of the prisoners in Sachsenhausen Concentration Camp 1936-1945” which first opened in 2001 is located in the two wings of the barrack and in the sanitation facilities. For the most part, the latter is in its original condition, and is located between the two wings. The exhibition design has been kept modest in order to maintain the possibility of an authentic impression of the prisoners’ barrack. Six large showcases set the tone for the visitor’s impression of the room. Six small films of about three minutes in length are projected onto walls of continuous, transparent gauze which extend throughout the inner spaces in front of the windows. Including examples of prisoners’ drawings in large format, these films provide a brief sketch of the basic aspects of the concentration camp prisoners’ daily life. The respective thematic focuses are made more concrete and understandable for the visitors by the careful choosing of particular key exhibits. Even though the SS determined the day-to-day routine down to the smallest details, daily life for the concentration camp prisoners was more like a permanent state of maximum alert. This daily life can only be described by the prisoners themselves; it is necessarily subjective. Any images which come from the perpetrator’s perspective play down or sugar-coat the daily reality. In actuality, this reality consisted of total authority, miserable living conditions and the arbitrary or planned terrorizing of the prisoners through abuse and murder. For this reason, the exhibition is solely based on the former prisoners’ memories. 20 prisoners were chosen as representations to reflect the whole breadth and diversity of the Sachsenhausen “prisoner society’s” political, social, religious, ethnic and national origins. They therefore describe their personal daily life in the concentration camp from the perspective of their respectively different experiences. A subset of relatively short clips from interviews with witnesses from the time or with relatives can be listened to with headphones or through speakers. The 120 narratives are complemented by the exhibit objects in the glass cases that are used to illustrate the prisoners’ verbal reports. In this way, some of the stories which are told about daily life in the concentration camp can become more tangible. The exhibition, designed by the architecture firm Prof. HG Merz, structures the subject into six sections: “The Paths to Sachsenhausen” reports on the different reasons for arrest; the “Prisoner Society” section addresses the often brutal hierarchy which existed within “the most extreme class system” (Primo Levi); “Work” looks at the different forms of forced labour, which was often the difference between life and death; and the section “Space and Time” discusses the complete expropriation of any freedom of movement. One section is devoted to the topic of “Violence, Dying, Death”. Finally, the last section,“Living with the Memory” depicts how the experience in the concentration camp shaped the lives of the former prisoners even after the liberation. To begin with, the 20 prisoners, chosen to exemplify the camp’s population, are briefly introduced at both entrances to the respective barrack wings. There are multimedia stations on each of Barrack 39’s gable walls which present the 20 biographies in more detail. The use of the sanitation facilities for the abuse and murder of prisoners is depicted using citations taken out of the trial records of SS perpetrators. In addition to the exhibition, a CD-ROM in both German and English is now available called “The ‘Daily Life’ of Prisoners in the Sachsenhausen Concentration Camp 1936”. The CD has received the awards, “Europrix. Excellence in New Media 2002” as well as “digita 2003” from the German Association of History Teachers (Verband der Geschichtslehrer). It can be bought for the special price of 10.80 euros in the Memorial Site’s bookstore.